The RUH has one of Bath’s most accessible exhibition spaces, open 12 hours a day, 7 days a week. 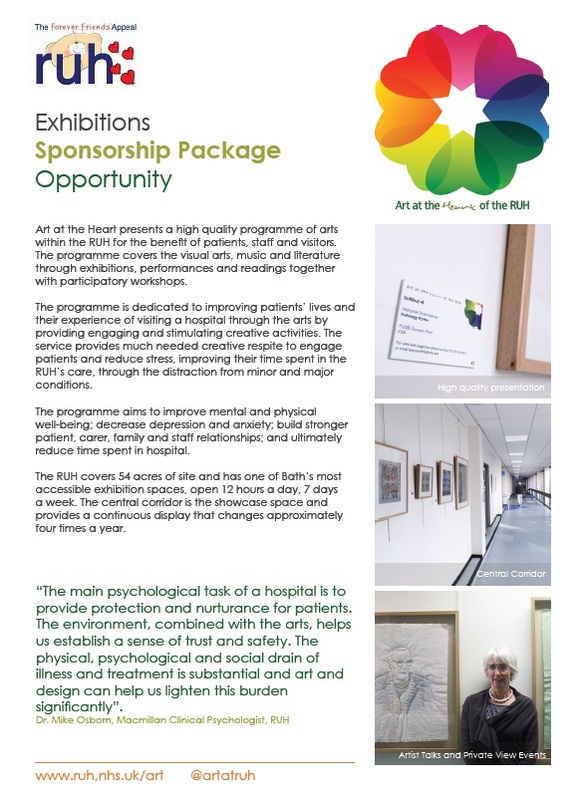 The hospital provides space for both amateur and professional artists, and arts organisations, to exhibit their work in a different environment and contribute to improving the lives of up to 200,000 people every year. In 2011 we received recognition for our outstanding exhibitions programme through a highly commended accolade from the Building Better Healthcare Awards and in 2014 we were awarded Best Arts at the Bath Life Awards. Over the last few years we have attracted temporary exhibitions from the Wellcome Collection, The Royal Photographic Society, the artist in residence for the London Olympics 2012, as well as stunning and thought provoking exhibitions from artists in our region that celebrate our local identity and diversity. The Central Corridor is the showcase exhibition space and provides a continuous display that changes four times a year. The North, South and West corridors display artwork that changes twice a year. In the course of the year we expect to show around 800 artworks in our temporary displays. Our temporary exhibitions also serve another important purpose in helping us to raise funds through the commission we make on sales. Art at the Heart of the RUH’s exhibitions are seen by hundreds of thousands of patients, staff and visitors of the RUH. To help meet the increasing costs of presenting these special exhibitions, The Forever Friends Appeal is turning to the corporate community for support. As an exhibition sponsor your company will enjoy a number of significant benefits and opportunities, outlined within our Exhibition Sponsorship Package. We invite you to join The Forever Friends Appeal and Art at the Heart of the RUH in a partnership that will meet the exclusive needs of your company, and bring great benefits to our patients experience through art and design. Please contact The Forever Friends Appeal Corporate Officer, Jo Common jo.common@nhs.net if you are interested or have any questions about sponsoring an exhibition.